Edward Gibbon by Henry WaltonMarch 26, 2011, Mr. Wilders continued (see first part) his remarkable horror story in front of a Roman public by referring to Edward Gibbon, a great 18th century British historian, whose "Decline and Fall of the Roman Empire" (1776-1789, 6 vol.) was a first exhaustive study into the fragility of empires. This intrusion from the North was neither the first, nor the last one that happened during the Migration Period. From the third century on, Roman emperors had been hiring German and Slavic tribesmen as soldiers, allowing them to settle in different parts of the Empire and using them to keep away new peoples coming from the East and the North. During the time we speak of, the East Roman Emperor in Constantinople was engaging Germans to attack his Western Roman rivals. Due, amongst others to climate change (! ), the largely Romanized peoples in the transdanubian and transrhenanian area, were driven from the colder regions to warmer climates. A large part of the Vandals ended up in North Africa, where their state subsisted for centuries. The Visigoths (from Sweden) settled in Spain. The Franks in France. Around this time, the Hasdingi [one of the two Vandal tribes, HR] had already been Christianized. During the Emperor Valens's reign (364–78) the Vandals accepted, much like the Goths earlier, Arianism, a belief that was in opposition to that of Nicene orthodoxy [Concilium of Nicaea, 323, HR] of the Roman Empire. Yet there were also some scattered orthodox Vandals, among whom was the famous magister militum Stilicho, the chief minister of the [Roman] Emperor Honorius [in Constantinople, HR]. In 400 or 401, possibly because of attacks by the Huns, the Vandals, under kingGodigisel, along with their allies (the Sarmatian Alans and Germanic Suebians) moved westwards into Roman territory. Some of the Silingi [the other Vandal tribe, HR] joined them later. Vandals raided the Roman province of Raetia in the winter of 401/402. Oh, my God! Those "barbarians" crossing the Rhine, they were ... Arian Christians! It was a match between Christians, not between believers and non-believers! Like it happens always in war, barbaric acts were perpetrated on both sides. Fellow (orthodox) Christians manipulated Arian Christians to attack Roman Christians. And, believe me, Jews and humanistic polytheists, they were discriminated against and chased away by all three of the Christian sects! If you read Edward Gibbon, even superficially, you'll find, that he attributes the decline and fall of the Roman Empire to imperial militarist authoritarianism, in particular the use of hired soldiers in the Praetorian Guard, who acted like sectarian militias in the way of the "stadscommandos" (the city vigilantes) the PVV is proposing now for more "security" in the Dutch cities. Rome's decline and fall came from within, if you follow Edward Gibbon's reasoning. From within Christianity, not from the outside. The fall of Rome was a traumatic experience. Numerous books have been written about the cataclysmal event and Europeans were warned not to make the same mistake again. In 1899, in his book ‘The River War ,’ Winston Churchill warned that Islam is threatening Europe in the same way as the Barbarians once threatened Rome. “Mohammedanism,” Churchill wrote – I quote – “is a militant and proselytizing faith. No stronger retrograde force exists in the World. […] The civilization of modern Europe might fall, as fell the civilization of ancient Rome.” End of quote. Winston Churchill was in 1899 writing as a young reporter about the Fashoda Incident in Sudan, stressing the need for Great Britain to secure a North-South corridor in Africa and exaggerating the "danger" of the Sudanese Mahdi movement, in order to get an excuse to occupy those regions before the French would do so. "Mohammedanism" was certainly not Winston Churchill's main concern. Which was proven only one year later, when he participated in the British genocide (the first concentration camps!) against the very Christian South African Boers, in spite of their firm Dutch roots. And it was under Churchill's reign, later on, that Muslim Palestinians and Jordanians were encouraged to fight Jewish immigration into Palestine. Mr. Wilders certainly has a gift. The gift of choosing examples that illustrate the opposite of what he wanted to prove. 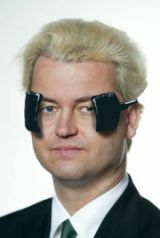 Mr. Wilders is not interested in facts that contradict his Manichean beliefs. Christians are always good, or 'superior' at least. Outsiders, in particular Muslims, are always bad, or 'inferior, backward'. A more realistic view on mankind is condemned as "Multiculturalism", in spite of the fact that there are no other civilizations than multicultural ones. ... if Europe falls, it will fall because, like ancient Rome, it no longer believes in the superiority of its own civilization. It will fall because it foolishly believes that all cultures are equal and that, consequently, there is no reason why we should fight for our own culture in order to preserve it. These are the rantings of a man, possessed by Angst. If Wilders had an idea of the wealth, the riches and the strength of Western civilization and it's multi-layered cultural content﻿, he would not be afraid of a possible "fall" of our civilization. But he is an uncultured demagogue, who, as a politician, should look out for solutions to the frictions caused by ever increasing globalism. But, like so many christian, jewish, muslim, buddhist, communist and fascist authoritarians before him, he creates horrible myths about the stranger, whose only concern, he says, is destruction of our society. In the third part of this series, we'll have a more close look into Wilders' remedies against multiculturalists with "weak knees" and the supposed worldwide Islamic conjuration they would be sponsoring. The first part was also published in At Home in Europe.